Last month, the construction industry was blamed for the UK falling into a double dip recession, with the Office for National Statistics saying there was a 3% contraction in Q1 compared to the previous 3 months. 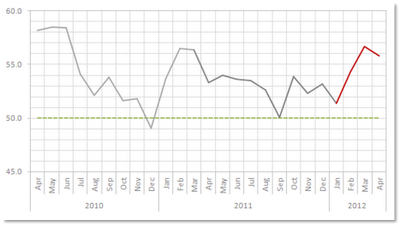 The PMI figures tell a very different story. 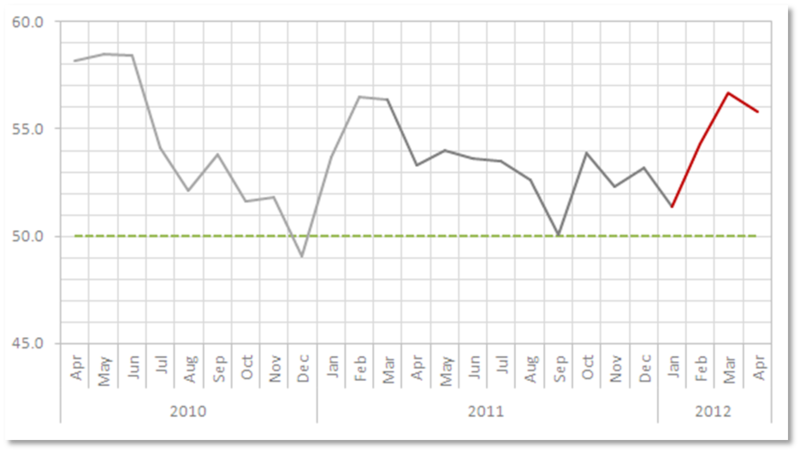 So what are the facts - the average PMI in Q4 of 2011 was 53.1 and rose to 54.1 in Q1 of this year - No contraction there! "...All construction data and surveys have to be taken with a considerable dose of salt at the moment as there are major discrepancies between what the surveys are indicating and what the hard data are showing." So helpful(!) But if you're looking for some silver lining, if the experts are telling us to take the figures with a pinch of salt, maybe we're not in a recession after all! I mean, what's an error of 0.2% compared to 3%?